A) Normal connection of a house (3) to the Public Utility Mains. The Public Utility circuit breaker (1) output is fed to the house (2). The EVOLVE is an advanced & compact Automatic Transfer Switch. This is the ideal choice for an home generator connected to your house in a standby configuration. It features programmable parameters for total protection of the engine, generator and your electric system. EVOLVE is the safest way to avoid back-feeding. The prices do include the freight if delivery address is within the EU. If you are a private EU citizen you can purchase the EVOLVE panel by using the options indicated below. If you are a 'COMPANY' with a valid VAT registration number we are not entitled to charge VAT. Contact us to get the price without VAT. NEED A REPLACEMENT FOR YOUR PRAMAC, HYUNDAI OR SDMO GENERATOR? YOU CAN USE OUR BE21 AMF ATS PANEL RATED AT 10KW. WE CAN SUPPLY IT WITH A CABLE FITTED WITH THE ATS CONNECTOR PLUS SUITABLE FOR YUR GENERATOR. When there’s a utility power outage the Evolve ATS panel turns on your home generator within seconds providing comfort and safety to your family or business. The plastic enclosure guarantees an IP65 protection when the transparent door is closed to the ambient environment. Thanks to its modularity, the EVOLVE panel allows you to add additional plugs and accessories as required. The panel is fully configurable for SMS monitoring (by your mobile phone). You will be notified on every home generator connection. The EVOLVE panel features a rich set of programmable parameters for total protection of the engine and generator. The internal electronic battery charger is overload protected and all electronic circuits are unaffected by over-voltages. The display indications can be configured for the most popular European languages. This provides for a complete list of electrical parameter measurements including an Energy meter for the Mains and Generator. The display indicates Vac, Aac, Hz, Vdc, kVA, kW, kVAr and Power Factor providing Energy count for both the Mains and Generator. It is easy to use by virtue of an intuitive front panel. You can program a designated period in the day to run the AUTO mode of operation. You can program a time slot in the day to test the home generator connection. Available languages for the display are: English, Italian & French. The Electronic battery charger is fully protected from overload. It protects your load from over-voltages. It records the last 200 Events including alarms. It indicates Oil Pressure, Temperature and Fuel Level of the engine. The EVOLVE ATS PANEL integrates an Automatic Mains Failure (AMF) control module, a Generating Set controller and a 32 Amp (50Amp. 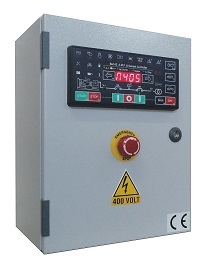 EVOLVE -9Kva) Automatic Transfer Switch (ATS). 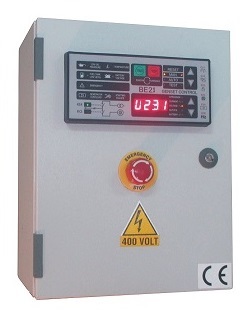 The EVOLVE ATS PANEL provides visual indication by means of LEDs and Graphic Display for all parameters and alarms. 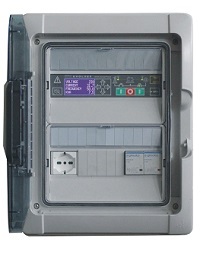 The EVOLVE ATS PANEL features programmable settings and complies with international regulations. The EVOLVE ATS PANEL can interface with analog sensors or switches for Oil Pressure, Fuel level, Coolant and Auxiliary Temperature. 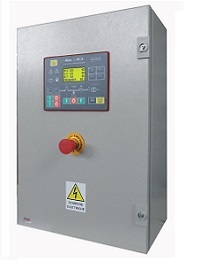 Additional inputs of remote control, alarms and serial interface allow you to expand the functions of the panel. Push the [MAN] mode button; the yellow indicator on the button will turn on. Push [MAN] until the engine starts (the yellow LED is then blinking fast). When the green indicator ‘Generator presence’ lights, push the [I-KG] push button; the green indicator KG ( Generator Circuit Breaker) will turn on to indicate that the home generator connection is properly working. If the green indicator ‘G’ is blinking or it is off, it means that the voltage is outside limits; in this case do not push the [I-KG] push button. To transfer the load to the Mains, push the [I-KM] (Mains Circuit Breaker) push button when the green indicator ‘Mains presence’ is on; the Generator Circuit Breaker will open and Mains Circuit Breaker will close after a 2-second delay. To open an internal circuit breaker (Generator or Mains), or to stop the engine, push the [O] push button at anytime. If you push and hold the [O] push button longer than 3 seconds, the Evolve ATS panel enters the OFF mode and disables the home generator connection. Push the [AUTO] push button until the yellow LED illuminates. The engine starts when the Evolve ATS panel detects a Mains failure. The Mains Circuit Breaker opens after the [MAINS BREAKER] timing. 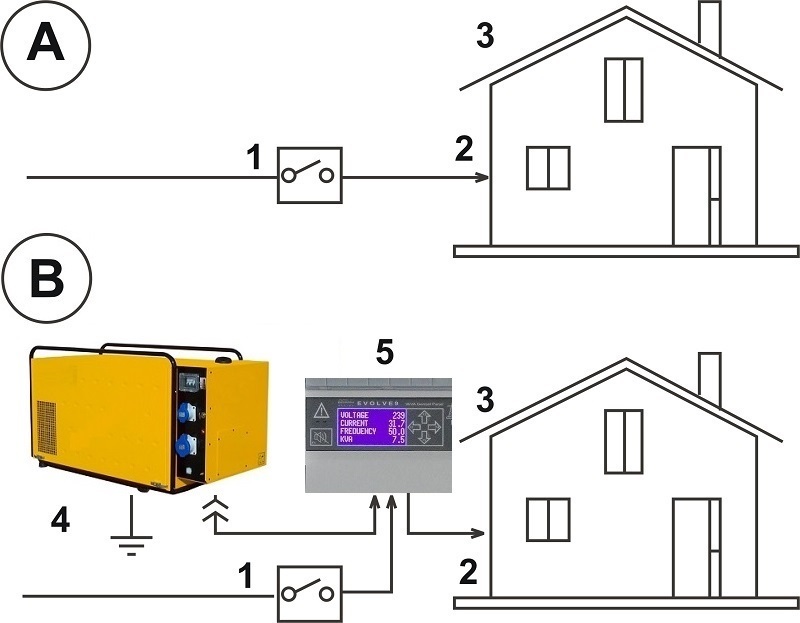 After the [WARM UP] time, if the voltage and frequency are within the settings, the Generator Circuit Breaker will close establishing the home generator connection. If the Mains restores, the Generator Circuit Breaker will open inhibiting the home generator connection. The power utility contactor will close following a programmed [KM CHANGEOVER] timing. The engine will stop after a [COOL DOWN] time. In AUTO mode, the Evolve ATS panel will periodically test the engine if the ‘Test Scheduler’ is correctly programmed. During the test, the yellow LED ‘TEST’ turns on and will continue to blink when engine runs. In AUTO mode, the Evolve ATS panel can start the engine if a ‘Remote Test’ is activated. You can disable the control of the power utility and disable the starting of the engine by programming the SLEEP mode or by using the ‘Mains Simulated’ function via a remote switch. In this case the green LED ‘Mains Presence’ will continue to blink and the home generator connection will be inhibited. You can stop the engine at anytime by selecting the Manual mode. You can also push the [O] push button, but in this case the Evolve ATS panel opens the circuit breakers and enters the OFF mode of operation. Push and hold the [AUTO-TEST] push button until the yellow LED TEST illuminates (5 seconds). When the engine is running, the yellow Led ‘TEST’ will blink. 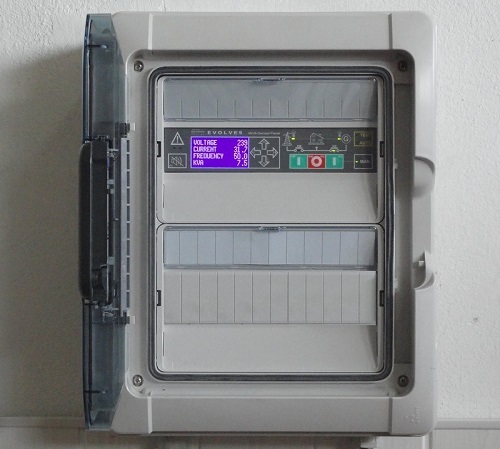 The EVOLVE ATS PANEL will start the home generator and transfer the load to the generator only in the case of Mains failure if not otherwise programmed. To exit the TEST mode, push the [AUTO-TEST] push button briefly (the engine will automatically stop if mains is present) or push [MAN] button (push again to stop the engine). The EVOLVE ATS PANEL, once in [SLEEP MODE] mode, will not start the engine even in the case of Mains failure. This function is required when you want to disable the home generator in a particular period of the day, during the night for example. First, you have to program the period in which you allow the start of the home generator in case of Mains Failure. After that, enter the AUTO mode. Outside of the programmed timetable, the green LED ‘Mains Presence’ will blink and the message [SLEEP MODE] will appear on the display. In cases where you need to start the home generator during [SLEEP MODE], you are requested to enter the MAN mode and proceed according the instructions given in section 2.2 of the instruction manual. If you enter the AUTO mode when the sleep mode is active, the engine will stop. 1) Look at the EVOLVE front panel: a yellow LED indicates a warning and a red LED indicates a shutdown. The display will automatically open the page that describes the alarm. 2) Some alarms, in order to cool the engine down, shut the engine down after a programmable delay. We recommend that you wait for the complete stop of the engine in all cases. 3) Push [ACK ] button in order to acknowledge the alarm and silence the horn. Push the [MAN] button to enter the Manual Mode of operation. 4) Consult the user manual for information about the alarm. Remove the cause of the alarm.